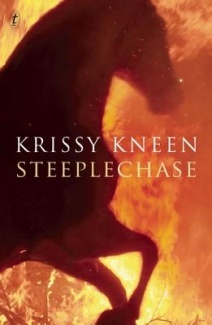 The steeplechase is a very clever metaphor for this book: I know that there are fans of this form of horse-racing, but there is also ongoing concern about it here in Australia (where it is banned in NSW and Qld) because of the death and injury rate for both horse and rider. Jumps racing is banned in NSW and in Qld but not here in Victoria where our Premier was the previous Racing Minister and member for Warrnambool which – contrary to its animal-welfare-friendly image for whale-watching – is the ‘heart-land’ of jumps racing. I find the whole concept of it cruel: it involves deliberately placing hazardous objects in the course and expecting the horse and rider to compete at speed over the jumps. It’s a cruel and dangerous sport. So the title, and the early chapters about Bec’s big sister Emily forcing her to play the role of horse in a steeplechase alerts the reader to the sense of menace that underlies this clever and exquisitely written book. If (like me) you have been a little doubtful about Krissy Kneen’s persona as a writer of erotica because the whole 50 thing was so tiresome, you can rest assured that this novel fits my criteria for a work of literary fiction. In adulthood, Emily is internationally famous, not just for her creative output but also for her ‘stunts’ – which are not really stunts at all, they are manifestations of the mental illness which claims her too. Bec is a self-doubting painter who teaches at university. She has been more successful in managing the madness which seems to run in the family, but she suspects that she will never achieve the genius of her sister without it. Bec’s twin desires – for a transgressive relationship with one of her students and for the insights that she thinks madness can bring – are brought into focus by her own exhibition and an invitation to Beijing to attend Emily’s exhibition there. She is torn between controlling her own behaviour, as her psychiatrist has taught her to do, and casting off the constraints which limit her opportunities for love and for art. Steeplechase is only a short novel of 200-odd pages but it is cunningly constructed and hard to put down. I hope Krissy Kneen writes more like this! Yes, Kneen certainly writes powerfully, however I did find the book very disturbing and the relationship between the sisters, which goes so far beyond sibling rivalry, definitely unsettled me. It says a lot for Kneen’s talent that she was able to make their story feel real and the concept of shared madness believable. I was less convinced by the love story. The older woman-younger man subplot didn’t win me over and felt a little half-baked at times. But I’m certainly going to read Kneen’s next novel. I think you’re right, this is a book that could easily have developed the subplot further. However, I am pleased to be discovering quite a few novels of shorter length lately – about 200 pages of crisply edited writing can be a real pleasure to read after a run of doorstoppers IMO. Thanks for liking my blog! I’ve been inspired to start one by reading blogs like yours, although your posting is so prolific, it’s a bit daunting! You’re right, wading through 700 page books is hard sometimes and a smaller book is a bit of light relief. I’m working through the James Salter canon for a future post and am heartened by the slightness of most of the novels…. Like A Dance to the Music of Time. Not exactly slight (and neither is Steeplechase) but it doesn’t demand intense concentration. Not like Proust IMO, to whom it is sometimes compared. Hi Lisa – just to clarify, I meant slightness in weight, not thought! I haven’t got a kindle yet, but some books – and A la Recherché du Temps Perdu is definitely one – are pushing me in that direction! I hate my Kindle, I only use it when I have to – for travel, and for old out-of-print freebies. Do you have a preference for the Proust? I read the Penguin edition that came out a few years ago, but different volumes are translated by different people so I’ve never been sure if that has affected my reading of it. Hi Lisa – I only know the Penguin in translation but as I was educated in France am more familiar with the original. I agree with you: nothing like the feel & reading experience of a real book! Unfortunately, I have arthritis in my wrists and it’s getting more and more difficult to lift weightier tomes now, so I suspect I’ll have to go down an electronic route eventually if a book is worth it, although my heart’s not in it.